Our last ‘At Sea’ day provided an opportunity for rest and relaxation after three packed days of island tours and activities. We did little more than have breakfast, lunch and dinner – though Jen and Rosiepoos both went to the gym, while I spent some time in the library. 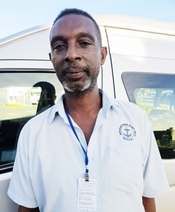 On day 13, which was really the last day of the cruise, 11 out of our 12-member party set out together on an air-conditioned bus for a partial tour of the island, courtesy of taxi driver Noel Parris (pictured left). Ours was the only ship in the dock that day. However, Noel explained that on the previous day, even though six cruise liners docked in the port, he did not secure any work. The passengers, mostly from the German cruise liners tend to walk to nearby spots and don’t use taxis. He was therefore happy to have a full bus, which included 11 of our party, plus another English couple from the Britannia. Even when our ship reached the port and we looked out onto the vista from our cabin balcony, it was immediately noticeable how industrialised it was. It was also evident how densely populated the island was in comparison with the other countries we visited. 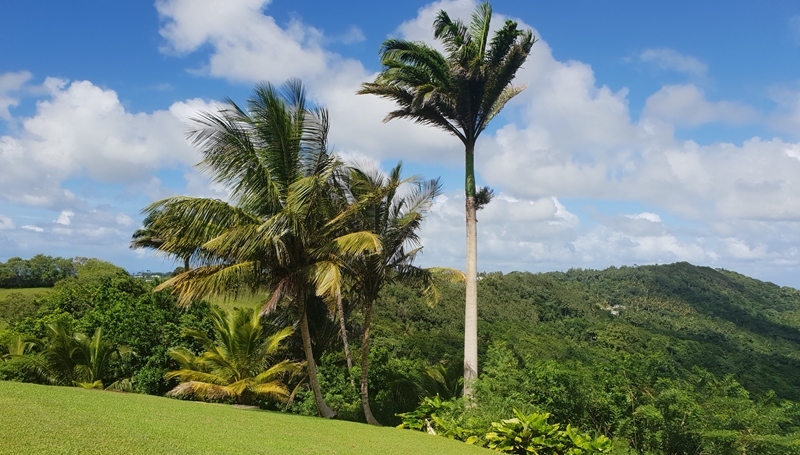 Our tour began in the swanky Royal Westmoreland in the parish of St James, which according to Noel provides rental homes for the wealthy elite, including celebrities like Oprah Winfrey and Rhianna, who has a street named after her. We drove past gated communities (pictured below) with beautifully landscaped gardens and whitewashed mansions. An attempt by Noel to drive past Cliff Richard’s house, was rightly rejected by the security guard at the gate, despite our insistence that were all members of his elite fan club. So we drove on past other luxurious residences, whilst singing “we’re all going on a summer holiday”! From there we headed to the oldest church in Barbados, St James Anglican Church, established in 1628 (pictured below). We then drove through what could have been mistaken for the English countryside; with verdant rolling hills, healthy cattle and a pond with a resident duck, stopping at the highest point in Barbados, Mount Hillaby (pictured below). This provided impressive panoramic views of the green mountains and sea in the distance, merging into an almost cloudless bright blue sky. While taking pictures, Rosiepoos and I got chatting to a couple from Islington in North London, sharing our experiences of the cruise and musing at the places we had been to. Such friendly exchanges were typical of our experience on the cruise – whether in the lifts on board the Britannia, or in the restaurants, or even in the deck corridors, it was rare not to exchange a hello, banter or chat with other passengers. 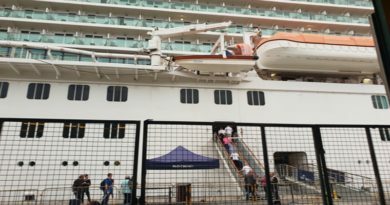 This social aspect of the cruise enhanced our holiday and I collected a few emails to stay in touch with some of the lovely people we met on the trip. We enjoyed a beer, some snacks, free Wi Fi and use of the rest rooms, before setting off again, this time to the most impressive beach of the entire cruise, Harbour Lights. Whilst expensive to get in – I paid U$20; this included a sun lounger, parasol, use of the restroom complete with shower and changing rooms and a free boat ride. Aside from the beautiful, golden sandy beach there were several bars and stands selling the usual crafts and jewellery popular with tourists. Since my clothes were in such disarray during my attempt to start packing for the return journey home, I forgot to launder my tankini sets, which were full of sand from previous trips. So, while the others went into the sea, I elected to do the complementary one-hour boat and turtle-watching ride (pictured below) and was glad I did, as it was a most enjoyable trip. Curiosity got the better of me, so while everyone remained on the lower level, I climbed to the upper deck of the boat, where I found local sailor Brian (pictured left), who trained for two years after leaving school to become a sailor and has his own boat to indulge his passion for sailing. Brian and I shared a light-hearted discussion about politics and life on the island. 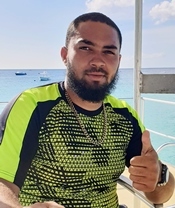 He pointed out the home of the Prime Minister Mia Amor Mottley, QC, leader of the Labour Party and the only female head of state in the entire Caribbean. It is evident from the well-developed infrastructure in terms of the roads, highways, shops and standard of housing, how far Barbados has risen as a former British colony, since gaining independence some 52 years ago in 1966. During our two-and-a-half-hour tour, Noel pointed out the social housing, comprised of small colourful homes dotted around the island that typically costs U$40k to U$50k, explaining that after 20 years tenants automatically become home owners, provided they have not accrued any arrears. Our last stop before returning to the Britannia was the Mount Gay Museum in Bridgetown (pictured below). While organised tours can be booked in advance via Trip Advisor, we opted for a casual browse around, since we all had to get back to the ship to finish packing. 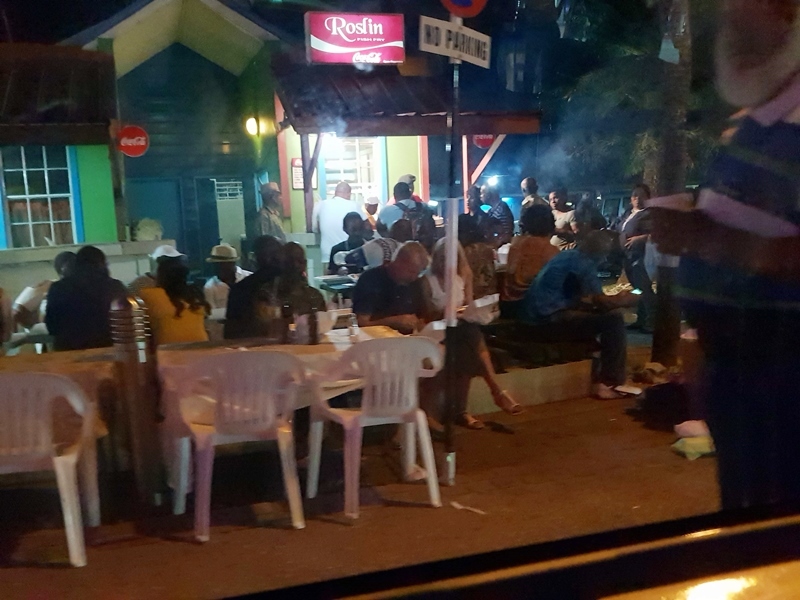 After returning to the Britannia to shower and change, we headed out again at around 8.30pm for an evening out to Oistins Fish Market (pictured below). It took around 25-minutes to get there, through bright lights and slow-moving traffic. Lights in the shape of fish greeted our arrival to a buzzing area with a diverse mix of locals and tourists spilling into the street. There were dozens of food stands, bars, shops and crafts stands, billowing smoke from cooking and a local man walking round with a small monkey, collecting dollars for photographs with tourists. Brian had suggested earlier in the day that Harbour Lights was the place to go to party with the entry fee of U$25 being inclusive of all drinks. However, a few of our party were tee-totallers, so the majority vote for our evening out was to head to Oistins. While it would have been lovely to dance the night away on the best beach of our Caribbean tour; since we had to rise early the following morning to clear our cabins by 8.00am, we decided against going to Harbour Lights, since people typically arrive from midnight and party the night away until the early hours of the morning. It was still a great night in excellent company and on arriving back to the ship we headed to a very busy Horizon restaurant where we enjoyed our last meal with fellow revellers, which included one of the band Steele’s members, who had just finished for the night. As we exited the restaurant to make our way to our cabins, the lido, was now adorned with two huge Christmas trees and decorations, signalling our departure as the Britannia prepared for its next cruise.